The ensemble’s growing discography includes two GRAMMY®-nominated releases and albums that have topped the “best of” lists of The New Yorker, Gramophone, and BBC Music Magazine. Their Avie Records releases, I sing the birth (AV2141) and Tudor City (AV2186) received widespread critical acclaim. Recent engagements include a debut performance at London’s Wigmore Hall, residencies at Dartmouth College and Stanford University, a broadcast holiday event for Minnesota Public Radio, and the European premiere of the Missa Charles Darwin—a newly commissioned secular Mass setting based on texts of Charles Darwin by composer Gregory Brown—at the Museum für Naturkunde in Berlin, Germany. In 2013, New York Polyphony participated in the New York premiere of Jonathan Berger’s chamber opera cycle Visitations at the PROTOTYPE Festival. 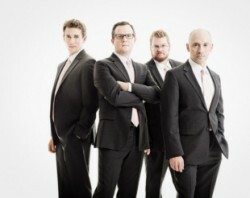 New York Polyphony has no upcoming tour dates. Please check back soon.